AFTER a Wolf Cub Scout earns his Wolf Badge he may begin earning Arrow Points in the Electives section of his book. He may work on his "Arrow Point Trail" at any time, however he cannot receive Arrow Points until AFTER he has earned the Wolf Badge. For the FIRST 10 arrow points completed in the "Electives" section of his book, the Wolf Cub earns his GOLD ARROW POINT. For EACH 10 arrow points completed (AFTER HE EARNS THE GOLD ARROW POINT) the Wolf Cub earns a SILVER ARROW POINT. He may earn any number of SILVER ARROW POINTS, but he may only earn ONE GOLD ARROW POINT for the first 10 elective points that he completes. Note: Be sure to sign off on each elective in the handbook and report it to your Den Leader at least one week before the Pack Meetings. It is up to you and your Den Leader to ensure the scout gets the proper recognition at the Pack Meetings. Write to a friend in invisible "ink"
"Write" your name using American Sign Language. People who are deaf use this language. Use 12 American Indian signs to tell a story. Help to plan and put on a skit with costumes. Make some scenery for a skit. Make sound effects for a skit. Be the announcer for a skit. Make a paper sack mask for a skit. Make something useful for your home or school. Start with a recipe card holder. Use the ruler on this page (125) to see how far you can stretch your hand. Make and use a bench fork. Play a game of marbles. Play a wide-area or large group game with your den or pack. Explain safety rules for kite flying. Make and fly a paper bag kite. Make and fly a two-stick kite. Make and fly a three-stick kite. Make and use a reel for kite string. Make a model boat with a rubber-band propeller. , h, i. Make or put together some kind of model boat, airplane, train, or car. Visit a bookstore or go to a public library with an adult. Find out how to get your own library card. Name four kinds of books that interest you (for example, history, science fiction, how-to-books). Choose a book on a subject you like and read it. With an adult, discuss what you read and what you think about it. Books are important. Show that you know how to take care of them. Open a new book the right way. Make a paper or plastic cover for it or another book. Learn to walk on a pair of stilts. Make a pair of "puddle jumpers" and walk with them. Make a pair of "foot racers" and use them with a friend. Name 10 kinds of trucks, construction machinery, or farm machinery and tell what each is used for. Help an adult do a job using a wheel and axle. Show how to use a pulley. Make and use a windlass. Help with a home or den party. , c. Make a gift or toy like one of these and give it to someone. Read a book or tell a story about American Indians, past or present. Make a musical instrument American Indians used. Make traditional American Indian clothing. Make a traditional item or instrument that American Indians used to make their lives easier. Make a model of a traditional American Indian house. Learn 12 American Indian word pictures and write a story with them. Learn and sing the first and last verses of "America." Learn and sing the first verse of our national anthem. Learn the words and sing three Cub Scout songs. Learn the words and sing the first verse of three other songs, hymns, or prayers. Write the verse of one of the songs you learned in the space below (on page 166). Learn and sing a song that would be sung as a grace before meals. Write the words in the space below (on page 166). Sing a song with your den at a pack meeting. Make a freehand sketch of a person place, or thing. Tell a story in three steps by drawing three cartoons. Mix yellow and blue paints, mix yellow and red, and mix red and blue. Tell what color you get from each mixture. Help draw, paint, or color some scenery for a skit, play, or puppet show. 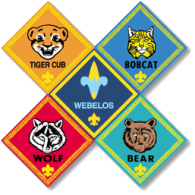 Make a poster for a Cub Scout project or a pack meeting. This elective is also part of the World Conservation Award. Make a list of all the birds you saw in a week and tell where you saw them (field, forest, marsh, yard, or park). Put out nesting material (short pieces of yarn and string) for birds and tell which birds might use it. Read a book about birds. Point out 10 different kinds of birds (5 may be from pictures). Feed wild birds and tell which birds you fed. Put out a birdhouse and tell which birds use it. Take care of a pet. Know what to do when you meet a strange dog. Read a book about a pet and tell about it at a den meeting. Tell what is meant by rabid. Name some animals that can have rabies. Tell what you should do if you see a dog or wild animal that is behaving strangely. Tell what you should do if you find a dead animal. Plant and raise a box garden. Plant and raise a flower bed. Visit a botanical garden or other agricultural exhibition in your area. Talk with your family about what you will do in an emergency. In case of a bad storm or flood, know where you can get safe food and water in your home. Tell how to purify water. Show one way. Know where and how to shut off water, electricity, gas, or oil. Make a list of your first aid supplies, or make a first aid kit. Know where the first aid things are kept. Learn to tie an overhand knot and a square knot. Tie your shoelaces with a square bow knot. Wrap and tie a package so that it is neat and tight. Tie a stack of newspapers the right way. Tie two cords together with an overhand knot. Learn to tie a necktie. Wrap the end of a rope with tape to keep it from unwinding. Help plan and hold a picnic with your family or den. With an adult, help plan and run a family or den outing. Help plan and lay out a treasure hunt something like this. Help plan and lay out an obstacle race. Use this idea or make up your own. Help plan and lay out an adventure trail. Take part in two summertime pack events with your den. Point out poisonous plants. Tell what to do if you accidentally touch one of them. Identify five different kinds of fish. Rig a pole with the right kind of line and hook. Attach a bobber and sinker, if you need them. Then go fishing. Fish with members of your family or an adult. Bait your hook and do your best to catch a fish. Know the rules of safe fishing. Tell about some of the fishing laws where you live. Show how to use a rod and reel. Play a game of tennis, table tennis, or badminton. Earn the Cub Scouting shooting sports Archery belt loop. Understand the safety and courtesy code for skiing. Show walking and the kick turn. Do climbing with a side stop or herringbone. Show the snowplow or stem turn, and how to get up from a fall. Know the safety rules for ice skating. Skate, without falling, as far as you can walk in 50 steps. Come to a stop. Turn from forward to backward. In roller skating, know the safety rules. From a standing start, skate forward as far as you can walk in 50 steps. Come to a stop within 10 walking steps. Skate around a corner one way without coasting. Then do the same coming back. Turn from forward to backward. Show how to make a sprint start in track. See how far you can run in 10 seconds. Do a standing long jump. Jump as far as you can. Play a game of flag football. Show how to dribble and kick a soccer ball. Take part in a game. Play a game of baseball or softball. Show how to shoot, pass, and dribble a basketball. Take part in a game. Earn the Cub Scouting shooting sports BB-gun shooting belt loop. With your den, participate in four outdoor physical fitness-related activities. Visit a business where computers are used. Find out what the computers do. Explain what a computer program does. Use a program to write a report for school, to write a letter, or for something else. Tell what a computer mouse is. Describe how a CD-ROM is used. Say "hello" in a language other than English. Count to ten in a language other than English. Tell a short story to your den, your den leader, or an adult. Tell how to get to a nearby fire station or police station from your home, your den meeting place, and school. Use directions and street names. Invite a boy to join Cub Scouting or help a new Cub Scout through the Bobcat trail. Participate with your pack on an overnight campout. Explain the basics of how to take care of yourself in the outdoors. Tell what to do if you get lost. Attend day camp in your area. Attend resident camp in your area. Participate with your den at a campfire in front of your pack. With your den or pack or family, participate in a worship service outdoors.